This battery operated silent wooden wall clock with 12 inch dial and famous Taiwan Young Town movement,non ticking and no case design,perfect for living room, bedroom, kitchen, office, cafe, restaurant, bar or hotel decor. 1.Movement: Famous Taiwan Yong Town 12888 Scanning Quartz Movement. 5.Hands: hour hand, minute hand and second hand. 1. [Silent Movement] - Famous Taiwan brand 12888 precise non ticking Scanning Quartz Movement, bring accurate time and silent environment. 2. [Retro Design & NO Case] - Lightweight with 5mm thickness and 12 inches dial with vivid painting,no case and no frame for the clock. 3. [Environmental Material] - Superior copperplate paper painting,durable and vivid color,made of environmental-friendly fiber wood. 4. [Battery Powered] - Only powered by 1pc AA battery (not included),easy to set and with hook to hanging on the wall. 5. 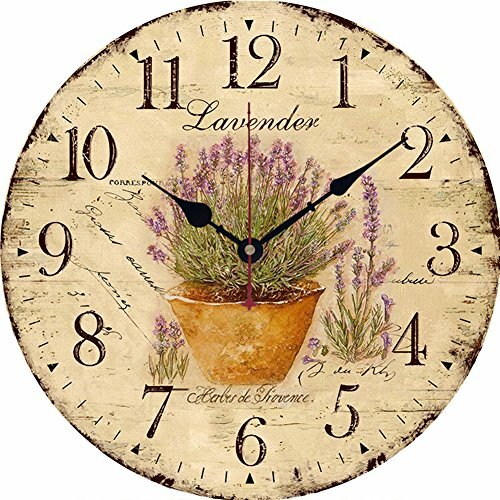 [Perfect Decoration] - Keep time with fashion and retro style decoration for your living room,bedroom cafe room or gift for your friends. If you have any questions about this product by Yesee, contact us by completing and submitting the form below. If you are looking for a specif part number, please include it with your message.